Whether you are a professional, entrepreneur or student, value your achievements and your many years of hardwork. Reward yourself. Let yourself and your loved ones experience the fruit of your accomplishments. 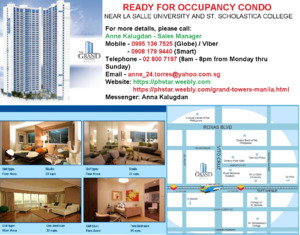 Have your icon of success, own a grand space at The Grand Towers. Note: Prices and specifications may vary depending upon the current units available.